This new picture book biography of Helen Frankenthaler is an absolute inspiration. With Elizabeth Brown’s poetic text and Aimee Sicuro’s dreamy illustrations, you and your children will be drawn into Helen’s colorful life and ready to create some masterpieces of your own. 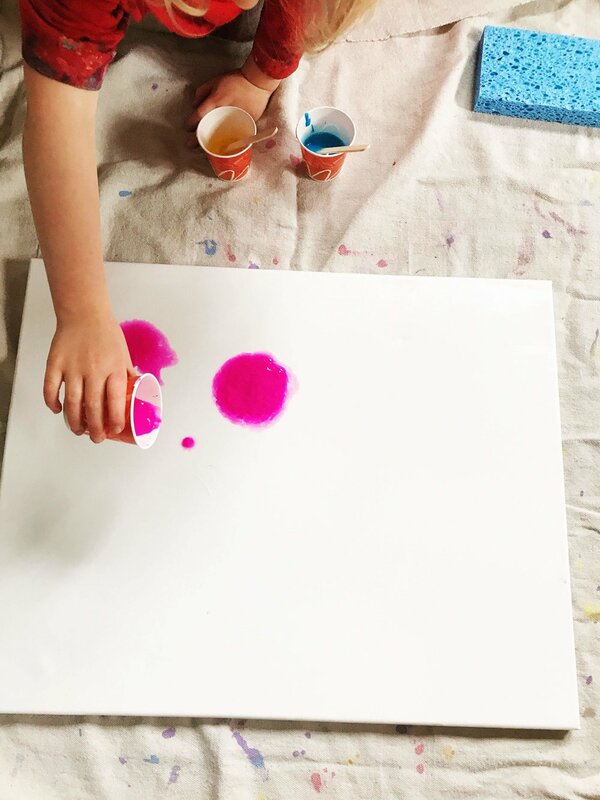 Luckily, this gorgeous story comes with instructions for a poured paint activity in the back of the book! This is a technique we’ve never tried before, and we were definitely not disappointed. sponges, pipettes, turkey baster…. 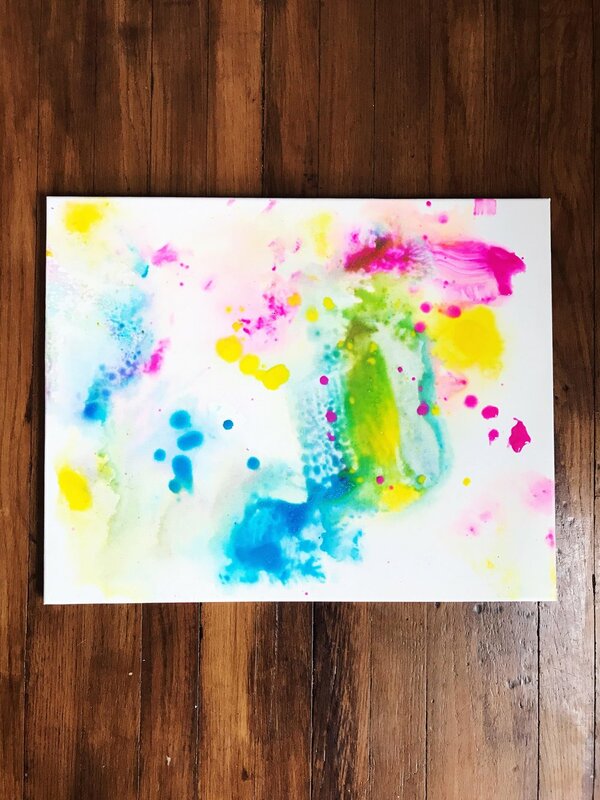 any tools you can dream up for moving around paint and water! Prepare your work area. The book suggests using a garbage bag… we laid down a garbage bag and a canvas tarp on top. This would be a great activity for outside too (then you don’t have to worry about the mess), but it’s a rainy cold day here today…. so the dining room it is! Begin by pouring colors directly from the cups. Watch how the paint mixes with the water! This activity is all about movement and fun! 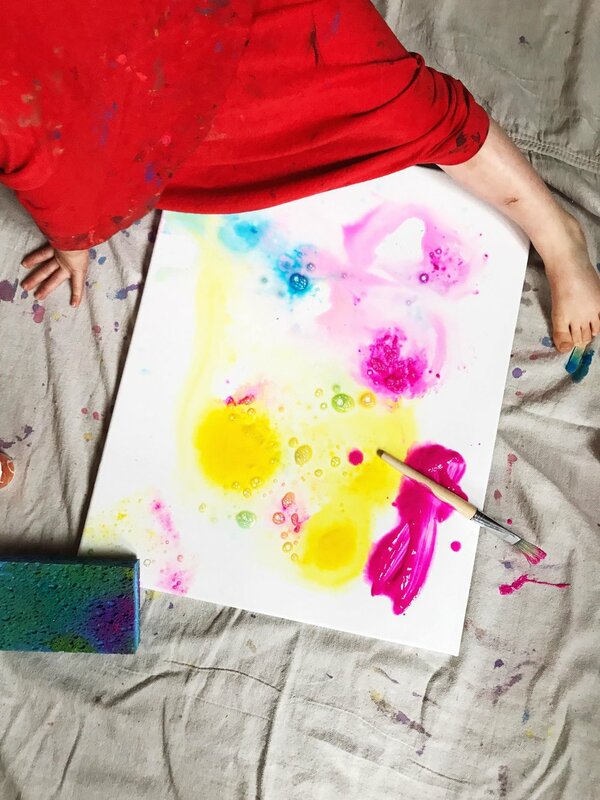 Encourage your child to walk around the canvas and concentrate on the process of the art rather than the final product. We will most certainly be trying this activity again. It was so fun and totally mesmerizing to watch the colors swirl and mix! Dancing Through Fields of Color: The Story of Helen Frankenthaler is available now from Abrams books…. look for it in your local library or bookstore!